I’m kind of obsessing about complexity theory right now (Dave Snowden’s Cynefin Model mostly), and looking at simple, complicated and complex systems. I had a lot of conversations about this last weekend, and have been thinking about it a lot. A couple of upfront disclaimers — first, I’m just learning about this, so I don’t pretend to really understand this stuff. It’s my interpretation, but it wouldn’t surprise me at all to know I’m getting the details wrong. Second, I’m not digging into Chaotic (for now at least). Third, there’s a much longer post on this brewing, and I have more questions than answers right now. Simple things (with explicit rule sets) are probably fine to assess via multiple choice tests. MCQs for multiplication tables? Sure! No problem! But complicated things (e.g. the subtleties of designing a scientific experiment) and complex things (e.g. problem-solving skills) do not have explicit rule sets, and are therefore NOT appropriate topics for a really reductionistic assessment methods. School testing models are trying to squeeze all the ambiguity out of the system by trying to control every variable. You can do that with simple and possibly with complicated systems (though it’s an insane amount of work — witness the amount of procedural documentation in the air safety industry, or the nuclear power industry in their attempt to eliminate all ambiguity. It’s usually only justifiable when people’s lives are at stake). But you can’t (by definition) eliminate all the ambiguity in complex systems. E.g. you can teach principals for problem-solving, or a process, but how it gets implemented depends on the context, which you can’t control. That’s where teachers, with their personal judgment and ability to adapt, become really important. It’s one of the limitations of computer-based instruction. People don’t like not having control. School testing is trying to exert control by pretending that everything can be put in the simple box, so it can be measures using simple, objective measures. But it just doesn’t work. I think there’s some real value in having a good way to assess whether or not you are dealing with a simple, complicated or complex situation, and adjusting not only your assessment, but also your learning design for that. Working on this, but if you know of anything really useful, please let me know. Chris Dede’s Sleeping, Eating, Bonding metaphor. The first link in this blog post has a short audio clip that explains it. Dave Snowden’s Youtube channel — a great entry point for complexity theory. This entry was posted in Behavior Change, Complexity, Human Behavior Wackiness, Instructional Design by jdirksen. Bookmark the permalink. Cybnefin is a major part of my pedagogical approach to designing mastery level competency. Fascinating! “Best Practices” are THE THING here at the college… and some of our admins love to have courses and sessions where they inform us what they are — when, in fact, it’s complicated, dude, adn different people in different contexts with different expertise will have a different “good practice” to apply … except we don’t know anything — we’re not the administrators! It’s so tempting to believe it can all be crammed in that box, isn’t it? I get why people want that, but it’s not helpful. 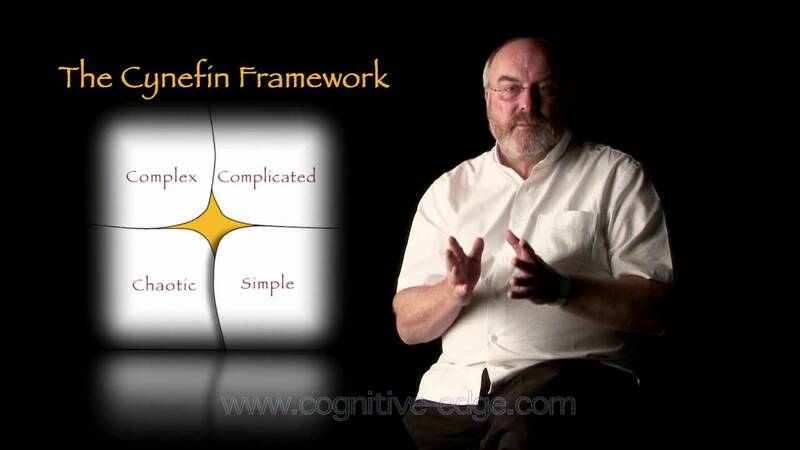 Prior to reading your post, I was not very familiar with Dave Snowden’s Cynefin Model. However after conducting further research, I agree that “School testing models are trying to squeeze all the ambiguity out of the system by trying to control every variable” and I think we should begin to use models and theories like Snowden’s so that educators can better understand what students are lacking, and how educators can use their skills and knowledge to further develop the skills of the students. Hm, theory looks all attractive, even if just for its ability to elicit frustration – people are not used to uncertainty and some are even more (psychological construct of need for closure both extracts and tries to deal with this phenomenon). Definitely I’d like to go through materials of how does it work – does it rely upon subsets having more less the same rules and then further integration of them within a larger set. Gonna look into this, definitely. Thanks for formal and abstract inspiration! You have mentioned that computer-based instruction or learning comes with a limitation. I failed to agree with you on this. According to me, elearning is as effective as face-to-face education and this is one of the reasons why it is expanding at a fast pace. More learners, ranging from students to working professionals, are choosing online learning for its qualities – machine-graded assessment, prescriptive course design, self-paced enrollment etc. The challenges witnessed by the educational institutions, comprising higher tuition fees, budget cuts and the shortage of courses, have pushed the learners or students to choose online learning. In fact, over the last few years, it has become evident that online education or elearning is the way forward and one of the most preferred medium along with popular higher education alternatives. This is pushing businesses to use elearning tools to improve the employee skills. Modern-age educators vouch for blended learning initiatives due to its ability to improve learning outcomes which help the instructors to better utilize their class time.